(CNN) -- Russian cyclist Denis Menchov has extended his overall lead to 20 seconds ahead of Sunday's final stage of the Giro d'Italia. 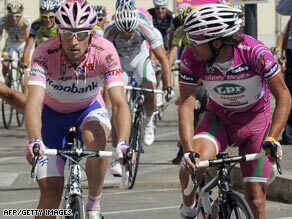 Denis Menchov, left, outwitted Danilo De Luca, right, on the 20th stage of the Giro d'Italia. Second-placed Danilo De Luca has a mammoth task to overcome the deficit in the nine-mile (14.4-kilometer) time-trial around Rome, having failed to peg back the Rabobank rider in Saturday's 20th stage. The Italian was left isolated without his LPR team-mates as he finished the 126-mile leg from Naples in 12th place, one behind Menchov. Menchov managed to outwit the 2007 winner and steal bonus points before being pipped on the line by LPR's fast-finishing Alessandro Petacchi during the mid-race sprint. Belgium's Philippe Gilbert won the stage by two seconds from Thomas Voeckler of France, with Italy's Stefano Garzelli coming in third. Franco Pellizotti of Italy was sixth, with the Liquigas team rider holding onto third place overall, 1 minute 43 seconds behind Menchov. Tour de France legend Lance Armstrong was 12th overall after finishing 64th on Saturday, one minute 38 seconds off Gilbert's winning time and 15 minutes adrift of Menchov's pink jersey mark. Gilbert made his move a mile from the end, taking off with Astana's Yaroslav Popovych and Voeckler in pursuit. The Ukrainian soon tired, and Gilbert had the legs as both he and his rival sought a maiden stage victory.